If you have any questions about the LADY CHRISTINE information page below please contact us. Coming from the Oceanco Yachts (Alblasserdam Yachtbuilding) yacht builder in the Netherlands the LADY CHRISTINE is 56 m 183 (foot) in length. Christened in 2001 the recent internal styling demonstrates the insight which are originating from The A Group / Gerard PVillate and the owner who commissioned the yacht. 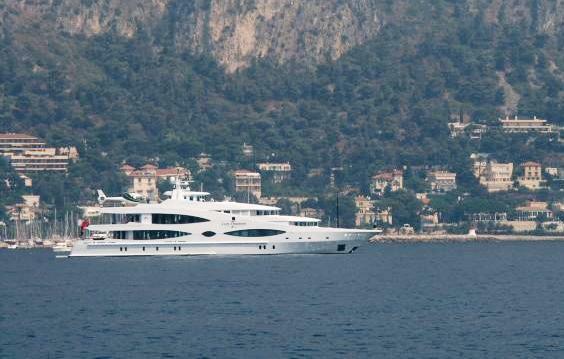 Superyacht LADY CHRISTINE is able to accommodate up to 10 people with 11 qualified crew. This large motor yacht has a helipad. She is able to reach a maximum speed of 16 knots. Oceanco was the naval architect firm involved in the technical vessel design work for LADY CHRISTINE. Also the company Oceanco successfully collaborated on this undertaking. Interior designer The A Group / Gerard PVillate was charged with the creative interior ambience. In 2001 she was formally launched to triumph in Alblasserdam and following sea trials and final completion was then delivered to the yacht owner. Oceanco Yachts (Alblasserdam Yachtbuilding) completed their new build motor yacht in the Netherlands. Her main hull was constructed with steel. The motor yacht superstructure component is made for the most part from aluminium. With a width of 10 metres / 32.8 ft LADY CHRISTINE has fairly large internal space. She has a deep draught of 3.51m (11.5ft). She had refit maintenance and modification completed in 2007. The 3516B DITA engine powering the yacht is built by CATERPILLAR. She is driven by twin screw propellers. The engine of the ship gives 2230 horse power (or 1641 kilowatts). She is fitted with 2 engines. The combined thrust for the yacht is 4460 HP or 3282 KW. With respect to stabalisers she was built with Koopnautic. The bow thrusters are Hrp. Offering chambers for a maximum of 10 welcome guests staying on board, the LADY CHRISTINE accommodates them comfortably. Normally the vessel has room for circa 11 capable crewmembers to maintain and sail. 55.63 metres / 182.5 feet. The propulsion comes from two 2230 HP / 1641 Kilowatts Caterpillar. The Model type is 3516B DITA diesel. Total engine power output 4460 HP /3282 KW. Cruising at a speed of 14 nautical miles per hour. Range in nautical Miles is 5000 at a speed of 12 knots. Northern Lights 2 times 155 kilowatts. Newport. United States. Newport County. Rhode Island. On October 2009 LADY CHRISTINE cruised Montauk, in United States. LADY CHRISTINE also cruised the cruising ground encompassing Suffolk County during Sept 2009. As she has a helicopter platform vessel LADY CHRISTINE has excellent distant speedy transfer capability. Heinen & Hopman is the company which installed the A/C . LADY CHRISTINE features a teak deck. The luxury yacht LADY CHRISTINE displayed on this page is merely informational and she is not necessarily available for yacht charter or for sale, nor is she represented or marketed in anyway by CharterWorld. This web page and the superyacht information contained herein is not contractual. All yacht specifications and informations are displayed in good faith but CharterWorld does not warrant or assume any legal liability or responsibility for the current accuracy, completeness, validity, or usefulness of any superyacht information and/or images displayed. All boat information is subject to change without prior notice and may not be current. "A shipyard sells a yacht and after the warranty period has concluded, often the client and yacht are forgotten. If you look at Oceanco, we see the client as a client for a lifetime. We take care of all of them, even if he has a 25 year old Oceanco." 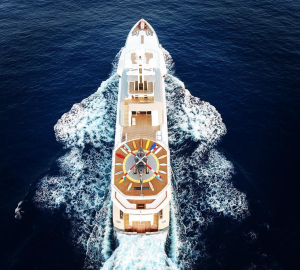 - Dr Mohammed Al Barwani, Oceanco Chairman, a world-class builder of custom superyachts in the 80–140 meters range: "We pride ourselves in integrating fine old world dutch craftmanship with sophisticated new world know-how and TOMORROW’S TECHNOLOGY. To our craftsmen, PERFECTION is a point of principle. We encourage a philosophy whereby each individual feels personally responsible for the quality of the entire yacht."